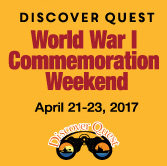 Experience interactive programs highlighting the Ghost Fleet of Mallows Bay and local World War I history. Mallows Bay Park and other locations. Please check website for details.